Indigenous curators can provide the extra details for museum exhibits that otherwise would be lost without their interpretation. You don’t have to search hard to find indigenous art in the world’s museums. Often, you can even find it in the world’s art museums. But, no matter where it is placed, finding exhibitions that have been curated by representatives from indigenous groups themselves can be somewhat more challenging. 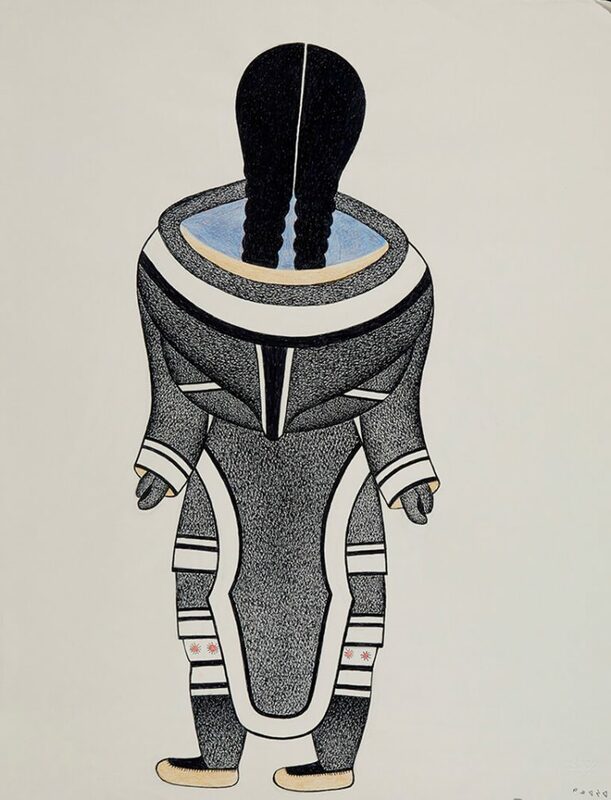 So, when Tunirrusiangit (“the Gift” in Inuktitut), an exhibition of the works of modern Inuit artists Kenojuak Ashevak and Tim Pitsiulak, opened in June at the Art Gallery of Ontario, it caught attention as much for who chose the art as for the art that was chosen. Tunirrusiangit is not unique in having indigenous curators select works of art they believe best represent their culture. In the Arctic, Nordnorsk Kunstmuseum, in Tromsø, Norway, surprised visitors last year when it secretly removed its permanent exhibitions and turned over the empty building to a Sámi curator, who became the temporary director of what, for a period, was the only Sámi art museum in existence. Other Northern museums, including the Anchorage Museum in Alaska, say they also seek to involve members of indigenous groups when showing art created by someone from their group. Tunirrusiangit, though, stands out as the first exhibition of its kind for the Art Gallery of Ontario after it, in 2017, announced that it was redefining what it considered Canadian art. Now, instead of placing indigenous art in separate category, the museum defines the works of artists like Ashevak and Pitsiulak as Canadian first and foremost. As part of the change, the museum set up a new department whose goal is to “challenge the traditional idea of Canada and our world.” The effort, the museum said at the time, was intended to result in exhibitions that displayed “different points of view,” something it considers one of its primary missions. Having Inuit select which items were to be chosen and how they are presented for the Tunirrusiangit exhibition ensures that viewers understand the works as the artists intended, according to Laakkuluk Williamson Bathory, one of the four curators. She describes, for example, how an Ashevak drawing of a woman facing away from the viewer (Untitled, 2004-2005) was misinterpreted by one critic to mean it showed a rejection of Western society. In reality, the most important part of the drawing is a woman’s pride in her sewing, according to Williamson Bathory. Williamson Bathory, though, sees curating an exhibition of art created by someone from her own culture as more than just a service for museum guests. In addition to displaying to the works of Ashevak and Pitsiulak, Tunirrusiangit includes a number of performances by Williamson Bathory any other Inuit artists. Likewise, prior to the opening, the curators held a traditional community meal that including butchering a seal in the museum. For Bathory and the Inuit curators, the inclusion of additional events is a sign that a change has taken place in the institutional acceptance of indigenous culture, yet, the feast, in particular, shows that barriers to full acceptance remain. 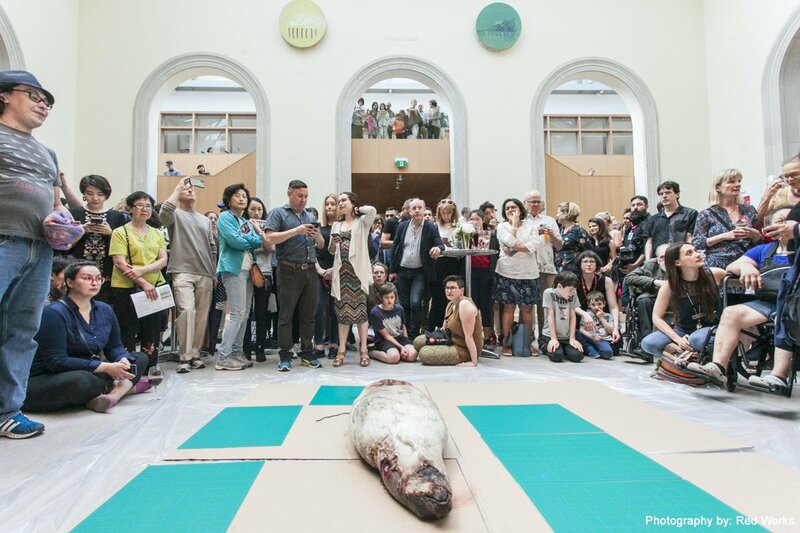 Because the seal was to be butchered in a public place, which city ordinances ban as unhygienic (and, by way of extension, inappropriate, according to Williamson Bathory), the museum needed to apply for special permission from city health authorities. In that past, getting a museum to put in that kind of effort the lengthy process required would have been impossible, says Williamson Bathory. Art Gallery of Ontario, however, did it without hesitating. For Georgiana Uhlyarik, the Art Gallery of Ontario’s curator of Canadian art, supporting the curators’ ideas was a part of the museum’s recognition that the decisions they made “amplified” the story of contemporary Inuit life that the exhibition seeks to tell. “The decision to use Inuit curators for an exhibit like Tunirrusiangit adds extra details that non-Inuit could not,” she says. Julie Decker, the director of the Anchorage Museum calls this practice “community curation” and agrees with Williamson Bathory that we are seeing more of it, thanks in part to a reaction against the traditional approach of asking someone from outside a culture to interpret it for audiences. She stresses, though, that involving outside voices is not the same as handing over the keys of the museum to them. The museum still decides what to exhibit, and, in the end, offers a seal of approval for what an exhibition concludes. 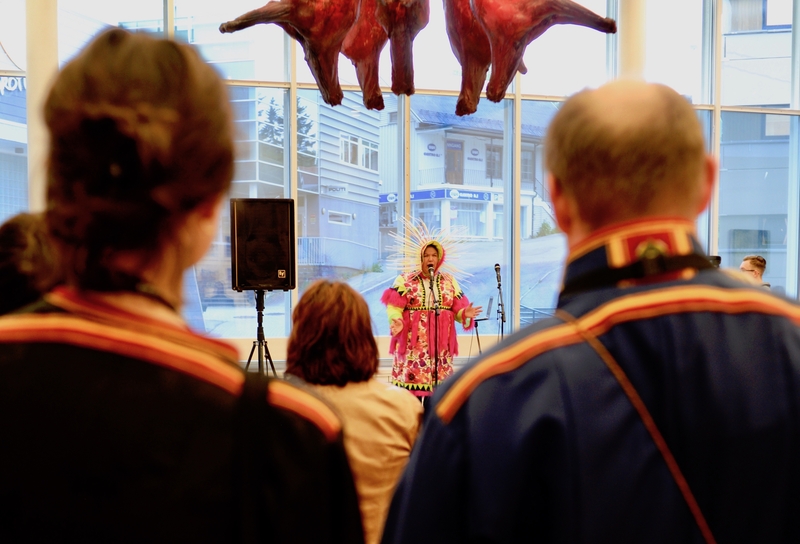 To achieve what it feels is the right balance between institutional control and community curation, Anchorage Museum has an indigenous curator on staff, and, like the Art Gallery of Ontario, uses external curators. Sometimes, though, other types of curators may be more appropriate. While considerations of who to include and how when it comes to indigenous art exhibitions, Decker believes, they are a part of good museum management. Below: Laakkuluk Williamson Bathory performing her poem “I am the light of the happiness” in connection with Tunirrusiangit.